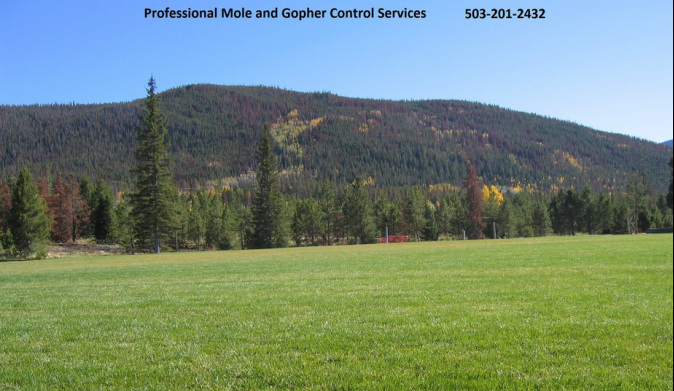 We remove moles, voles, and gophers from your yard and garden throughout all of Northwestern Oregon. Moles and Gophers can leave piles of dirt ruining your yard. Gophers can destroy gardens by eating the plants and vegetables. Voles will dig little holes all over your yard and making large tunnel systems underground. Why Choose Oregon Mole Control? We offer quality service backed by over 30 years in wildlife damage management. We will not sell you anything that we don't think you need and always guarantee satisfaction. We are a local family business out of Hillsboro, Oregon but service the greater Portland, Or area. Every job is different because so much depends on location, type of animal, amount of damage, and based on the information we use different techniques to remove moles, voles, and gophers. There is no magic product or spray for removing moles, gophers, and voles it takes work and we enjoy doing the work for you! Moles Gophers Voles Other Nuisance Animal I have no idea!! Moles and Gophers in your yard can be a big pain. When deciding to trap or remove them from your yard you need to consider a few things before acting. We are not going to say that non of the poisons or magic sonar spikes work, but from our experience the only true way to control moles and gophers in your yard or garden is to trap, remove, then maintain. Once you have moles, gopher, or voles in your yard there is a good chance you will have them again. The key is to remove them at the first sign. Once you have control the population at your property it is important to always keep a watch for fresh mole and gopher hills along with vole holes. If you wait too long the damage can become a lot greater and harder to get under control. We are able to control any of your residential Mole, Gopher, and Vole problems before the damage gets out of hand. 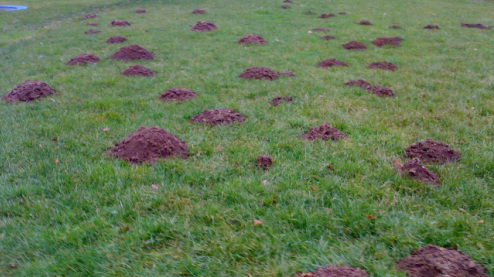 At first sign dirt mounds or vole holes call the professionals to defend your lawn and property from mole, gopher, and vole damage. Multiple mole hills in yard. When dealing with large fields and green ways you are more than likely going to have mole, vole, and gopher problems. It is important to control the problems because with such large areas it is nearly impossible to remove all nuisance animals from the property. Moles and Gophers can do lots of damage to farm fields, vineyards, cemeteries, and golf courses. We are equipped to handle what ever problems you have. Let us handle all your mole, vole, and gopher problems so you don't have to worry about them anymore. Due to the number of factors that go into handling different jobs we setup a plan for each job. In most cases we are able to set up the job and have it under control with in a month and then work on a maintenance plan. For commercial properties or houses with large mole, vole, gopher problems in the greater Portland area we can provide a management service plan. This not only helps to prevent the damage caused by these pest critters but to also keep down the cost of multiple services calls every year. Setting up a maintenance service plan is the best solution for golf courses, farm fields, gardeners, homeowners, and property management service that have high activity of mole, vole, or gopher damage. Maintenance plans are the best solution because the process helps to prevent future damage by removing the nuisance animals before the problem can cause more damage. Step 1: Full property inspection for most recent activity and setting traps. Step 2: Remove current mole, gopher, and vole causing damage at the property. Step 3: Mark or clear all current dirt mounds or activity at the property. Step 4: Monitor the property for signs of new dirt mounds and activity. Step 6: Restart maintenance process at step 3. Mole, Vole, Gopher Free Field!